Each of these attractions are accessed by taking Hilltop Rd 2kms east of Walpole; it is a gravel road but safe for 2 wheel drive vehicles to use. Hilltop Lookout is the first stop; from here there are spectacular views over the Frankland River, Nornalup Inlet, Southern Ocean & the surrounding forest. A few kilometres further along Hilltop Rd is the car park for the Giant Tingle Tree and then the final stop is Circular Pool which is well signposted. The return journey from Circular Pool is via Allen Road. 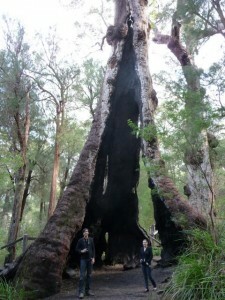 The Giant Tingle is estimated to be 300 years old it has a girth of 24 metres making it one of the largest trees in existence. This giant is a Red Tingle found only in the forests surrounding Walpole. The tree was damaged by fire in 1937 & 1951 and even though it is hollowed out continues to survive today. 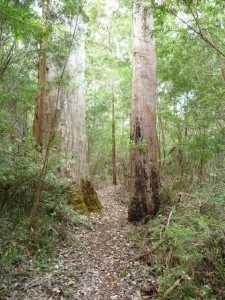 The Giant Tingle Tree is 800m return walk on a loop trail. There are toilet facilities here. Circular Pool is a large pool located on the Frankland River; the name is derived from the circular motion that the cappuccino coloured foam makes around the pool. 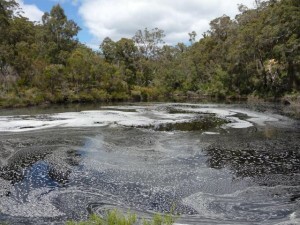 The foam is created by tannins leaching into the river from native vegetation. There are several viewing platforms and wheelchair access is available. Circular Pool is most spectacular after heavy rains in Winter & Spring. There are toilet facilities here as well as several spots that would be ideal for a picnic. The Knolls can easily be accessed by car but a much better way to do it is either on foot or by bike. We got our Mountain Bikes out and headed off from the Walpole Lodge and joined the Coalmine Beach Heritage Trail where it meets with the Bibbulmun Track. The track is dual-use here so it is ok to ride bikes on it. The track is in good condition; except for a sandy section right at the start. Last time we had headed over this way we had seen a Quokka and were hopeful of seeing more fauna this time. Unfortunately we only saw a Blue Wren and some cockatoos. 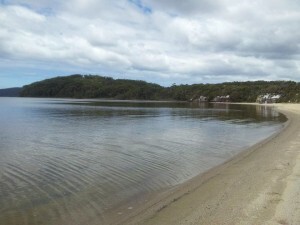 It is only a 10 minute cycle over to Coalmine Beach and depending on the wind direction a good safe place to cool off. 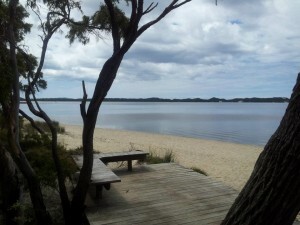 There are a couple of BBQs, toilet block and outdoor shower that would make this a good place to have a picnic and spend the afternoon at the beach. We continued on to the road around the Knolls. The road is one way only and whilst vehicles do use it we didn’t encounter any today. 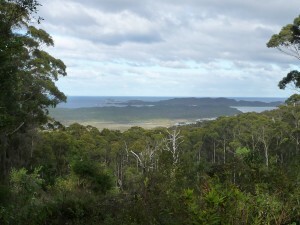 There is a lookout over the Nornalup Inlet which we stopped at and another two spots which have car parking and steps down to the water’s edge for fishing. The Channels is the next spot we came across; this is the channel between the Nornalup & Walpole Inlets. We have been fishing here in the past and it’s a good spot for Black Bream, Herring & Skippy. 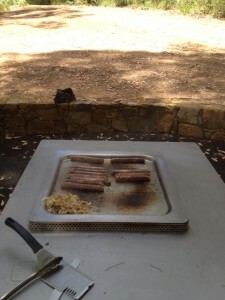 The Channels also has a gas BBQ and toilet block. Continuing around the Knolls we reached another lookout; this time over the Walpole Inlet and through the trees could see Rest Point, The Lady Walpole and the Walpole Town Site. Even with a couple of stops the ride around the Knolls and Coalmine Beach Heritage Trail only took us 45 minutes. Next time we will stop for a picnic and maybe a swim! Located in the Mount Frankland National Park just north of Walpole, Mount Frankland & Fernhook Falls are worth spending a few hours exploring. Mount Frankland is 410m high and the short but steep loop walk takes you to the peak for fantastic views of the karri forest and Frankland River below. Combining a walk around the base of the granite mount, surrounded by towering karri forest and superb summit views this trail is sure to impress. The walk to the summit is 1km with the walk around the base being 1.5km. You do not need climbing experience to reach the summit; just a reasonable level of fitness as there are 240 steps and a couple of ladders. 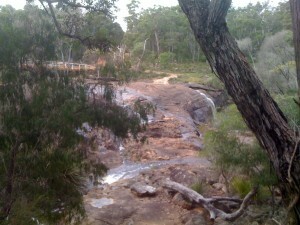 Fernhook Falls is an attractive bush camping and picnic spot on Deep River. 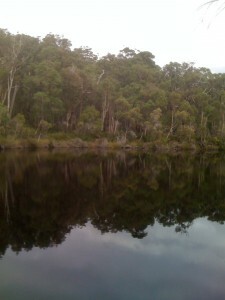 Deep River is one of the few rivers in the south-west within an almost completely forested catchment. As a result, although heavily loaded with organic tannins, the water is of high quality. There is a walk trail and boardwalk that follow the Deep River giving great views of the falls. Part of the walk trail is universally accessible. Spectacular in winter when it flows in heavy torrents, the falls spill down over granite rocks and into Rowels Po ol. From Rowells Pool you can canoe/kayak down the river all the way to the South West Highway a distance of 38.9km – this would take 3 days with overnight camps at Gladstone Falls & Centre Road. The water levels are only high enough between June & November. Fernhook Falls offers tent sites, camp huts, picnic tables and campers’ kitchen set among the forest. There are excellent BBQ and toilet facilities at both of these attractions, but we normally finish our visit with lunch at the Thurlby Herb Farm.